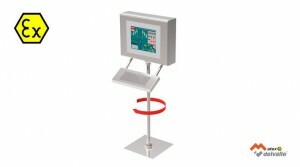 Workstation Atex from Delvalle, PCEX series, with remote monitor. Devices installation in zone 1, 21, 2 and 22. Conditions in processing plants can be extremely problematic. Industrial monitors can be subject to moisture and extreme temperature shifts as well as solvents, chemicals, and pressure cleaning. For HMIs, this challenge is easily resolved by placing only the most essential components in the field and using data lines to establish a connection to the equipment in the safe area. This separation minimizes most of the components’ exposure to harsh conditions and decreases the chance for failure. 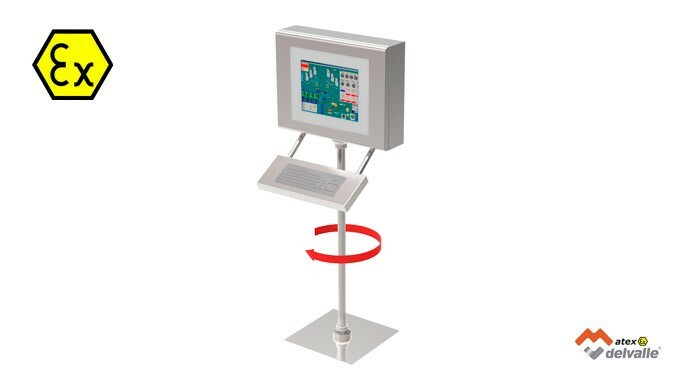 Workstation Atex have been designed and optimized for use in regulated industries such as pharmaceutical, food and beverage, or cosmetics. Class I/ Division 2, A – D, Class II Division 2, F&G, T4. Directive 94/9/EC : EN 60079-15:2010, EN 60079-0:2009, IECEx 60079-14, IECEx 60079-0.